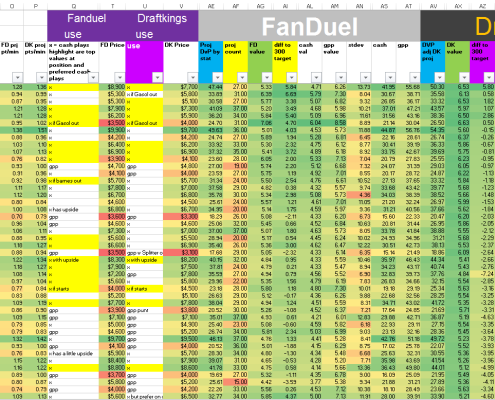 Your home for advanced statistics & research tools for the Daily Fantasy Sports industry! Take advantage of our Premium content and start crushing your DFS lineups every single day! 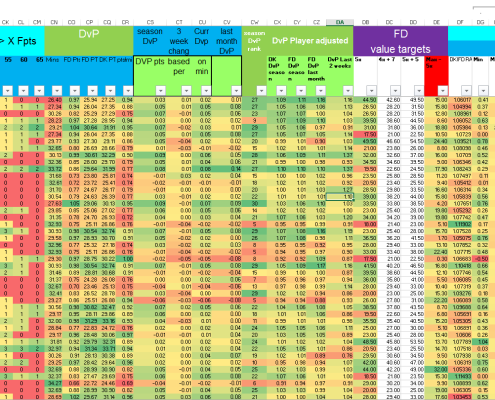 Get Sortable DFS Cheat Sheets outlining tons of different variables. Identifying the top plays at each positions, as well as Cash Game vs GPPs plays for the day. 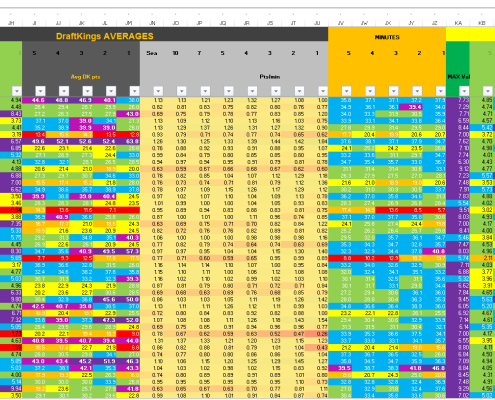 Custom DvP Data, Daily Value Plays, Player Projections With 20+ Variables, Ceiling/Floor Projections for Cash & GPP Games, Target Score Frequency, Pace/Team Efficiency Data and MUCH MORE! Get access to 1000s of Optimized Lineups for each days games. Lineups will feature the top plays, best values and are all backed by custom analytical data. I graduated with a BS and MS in Computer Engineering and a Mathematics Minor from the University of Illinois at Urbana-Champaign, GO ILLINI! My concentration was in Computer Architecture and High Performance Multi-Core Processors. I have over 12 years of experience in the Software industry, I’ve worked for Microsoft, Intel, a startup in the Medical field, and a couple Aerospace companies. 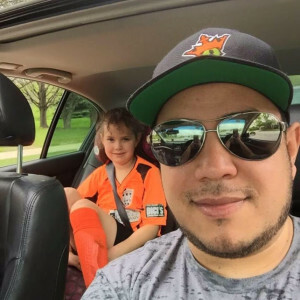 All of this experience has helped me in Daily Fantasy Sports (DFS) a great deal, being able to analyze large amounts of data, solving problems every day, programming to solve complex problems faster, writing scripts to automate daily tasks, etc. I started playing DFS in 2011, and first started by building a simple spreadsheet to create projections and an NBA lineup Optimizer. Back then there were no sources or websites that offered daily projections. Over the last 5 years I have improved and added many more variables to my NBA model, even to this day, I am constantly adding new advanced stats all the time. 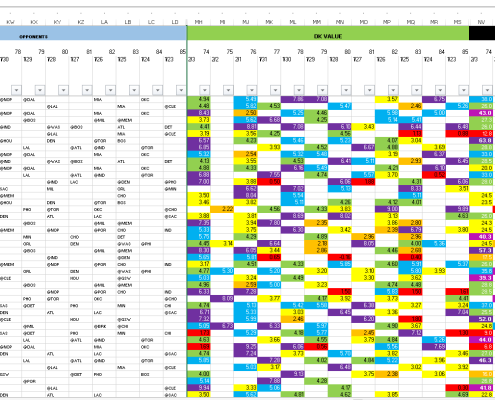 My daily process includes doing projections for every single player, then feed the projections into my lineup optimizer, which generates an Excel file with thousands of lineups from the player pool I’ve selected. You can check out a sample of my NBA Data Sheets below! Here is a look at our data sheets that get published for each days games. 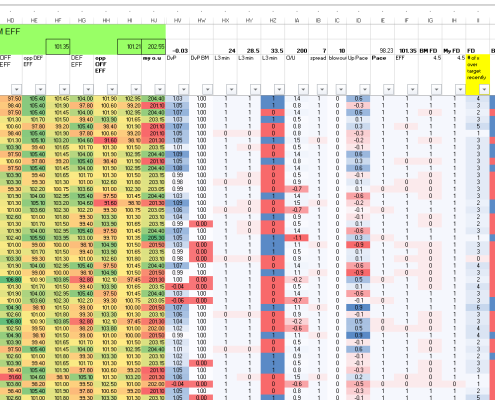 You can use these sheets to help build your daily lineups and crush the DFS competition! If you want to get a more in depth look with our Premium Data Sheets, you can get a Premium One Day Trial for just $10 and get access to the entire spreadsheet with the day’s player pool and all the custom analytics we have, including thousands of optimized lineups for the the day’s games!